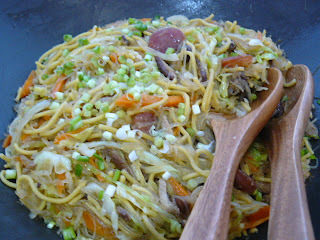 This month's theme at Kulinarya Cooking Club is Pancit. I was inspired by my bible of Filipino cuisine, Memories of Philippine Kitchens. The authors, Amy Basa and Romy Dorotan say, "Ask a Filipino to name typical dishes and he or she will invariably list pancit and lumpia. I encounter dumbfounded looks when I mention that these are Chinese in origin. Much of Filipino home cooking traces its roots to Chinese ingredients, cooking methods, and seasoning. The influence of the Chinese came with the traders (from Fujian and Canton), who brought noodles, ducks, duck eggs, soy sauce, soybeans, sausages, and other affordable, accessible foods that could be eaten on a daily basis." 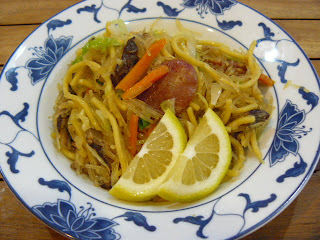 Each family has their favorite recipe of pancit, using a wide range of ingredients. Our version is one made by Yaya, who helped care for my boys as we hopped from country to country, and introduced them to the tastes, smells, and textures of Philippine home cooking. Thanks to her, the kids never cringed at the smell of fish sauce, or the sight of a fish head popping out from a bowl of soup, or an overload of garlic in their fried rice. Yaya decided to retire many years ago, after we moved (again!) to a country she thought was too cold for her arthritis. Yaya's Pancit embodies all the care and love she shared with us. There is never a day that we don't miss her. Soak vermicelli noodles for 30 minutes, making sure water covers noodles. Drain and set aside. 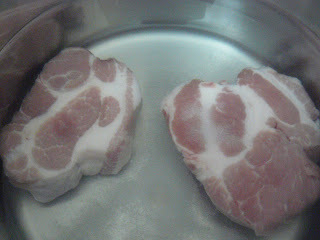 Place pork cutlets in a pot and add 6 cups water and salt, bring to a boil, then reduce heat and simmer for about 20 minutes until pork is cooked. Set aside to cool. Slice thinly and set aside. Leave broth in pot for later use. Heat oil in a wok and saute sausage and pork. Add garlic and onions and cook until softened. 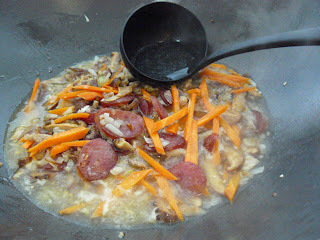 Add mushrooms, carrots and ½ cup of broth and saute for 2 minutes. 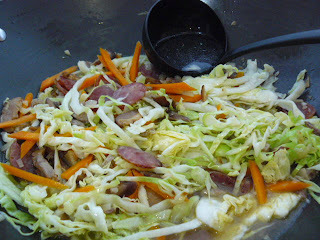 Add cabbage and another ¼ cup of broth and cook for another 2 minutes. 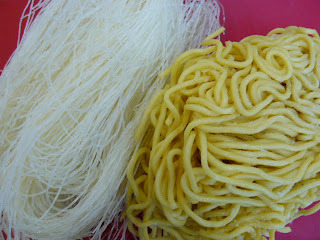 Mix in vermicelli and egg noodles, continue cooking while mixing thoroughly until the broth is absorbed by the noodles. Season with soy sauce and fish sauce, salt and pepper. Toss in the sliced spring onions. Serve with calamansi or lemon wedges. The beauty of pancit are all the different variations. Yours look so good. hi annie! thanks for dropping by and im glad to visit yours as well..
Will try to make for Ian's graduation party. 150 of his friends RSVP'd. 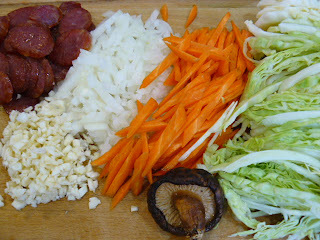 I need to good lumpia recipe, the one that has meat and water chestnuts and toyo. Do you have something like that? Prepare, freeze, and fry the day of. Help, Annie, Help!!! Great combination of vermicelli and egg noodles! Looks very delicious! You combined noodles?? interesting!! next time I want to use egg noodles and see how it tastes! Thanks Ladies! The only problem with Pancit is that you eat way too much of it!